Will We Ever Find Dark Matter? 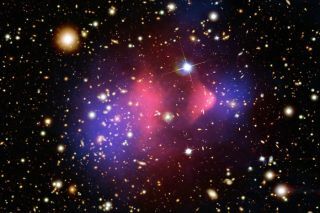 In this image, dark matter (blue) has become separated from luminous matter (red) in the Bullet Cluster. Kelen Tuttle, writer and editor for The Kavli Foundation, contributed this article to Space.com's Expert Voices: Op-Ed & Insights. Scientists have long known about dark matter, a mysterious substance that neither emits nor absorbs light. But despite decades of searching, they have not yet detected dark matter particles. With ten times the sensitivity of previous detectors, three recently funded dark matter experiments — the Axion Dark Matter eXperimen Gen 2, LUX-ZEPLIN and the Super Cryogenic Dark Matter Search at the underground laboratory SNOLAB — have scientists crossing their fingers that they may finally glimpse these long-sought particles. Enectali Figueroa-Feliciano: Figueroa-Feliciano is a member of the SuperCDMS collaboration and an associate professor of physics at the MIT Kavli Institute for Astrophysics and Space Research. Harry Nelson: Nelson is the science lead for the LUX-ZEPLIN experiment and is a professor of physics at the University of California, Santa Barbara. Gray Rybka: Rybka leads the ADMX Gen 2 experiment as a co-spokesperson and is a research assistant professor of physics at the University of Washington. The SuperCDMS experiment at the Soudan Underground Laboratory uses five towers like the one shown here to search for WIMP dark matter particles. Below is a modified transcript of the discussion. Edits and changes have been made by the participants to clarify spoken comments recorded during the live webcast. To view and listen to the discussion with unmodified remarks, you can watch the original video. The Kavli Foundation: Let's start with a very basic, yet far from simple question. One of our viewers asks how do we know for sure that dark matter even exists. Enectali, I'm hoping you can start us off. How do you know that there's something out there for you to find? E.F.F. : The primary evidence telling us dark matter is out there is from astronomical observations. In the 1930s, evidence first came in the observations of the velocities of galaxies inside galaxy clusters. Then, in the 1970s, it came in the velocities of stars inside galaxies. One way to explain this is if you imagine tying a string around a rock and twirling it around. The faster you twirl the rock on the string, the more force you have to use to hold onto that string. When people looked at the velocity rotations of galaxies, they noticed that stars were moving way too fast around the center of the galaxy to be explained from the force you could see due to gravity from the mass that we knew was there from our observations. The implication was that if the stars are moving faster than gravity could hold them together, there must be more matter than we can see holding everything in place. Today, many different types of observations have been done at the very largest scales, using clusters of galaxies and what's called the cosmic microwave background. Even when we look at the small scale of particle physics, we know that there are things about the Standard Model that aren't quite right. We're trying to find out what's missing. That's part of what's being done at the Large Hadron Collider at CERN and other collider experiments. Some of the theories predict particles that would be good candidates for dark matter. So from the largest cosmic scales to the smallest particle physics scales there are reasons to believe that dark matter is there and there are candidates for what that dark matter can be. TKF: Harry, I'm hoping that you can follow up on that a little bit. Your experiment and the one Enectali works on both look for the most promising type of theoretical particle, one that interacts so weakly with the matter in our world that it's called the WIMP. In fact there are more than thirty dark matter experiments that are currently planned or underway, and the great majority of them search for this same type of particle. Why do all these experiments focus on the WIMP? H.N. : First I want to emphasize that WIMP is an acronym, W-I-M-P, which stands for weakly interacting massive particle. "Massive" means a mass that's anywhere from a little smaller than the mass of a proton up to many times the mass of a proton. The WIMP is so popular in part because it's easy to fit into descriptions of the Big Bang — maybe the easiest to fit. The concept to understand here is called thermal equilibrium, and that's just when you put something in the refrigerator it ends up at the same temperature as the refrigerator. I had a leftover sandwich last night from when I went out to dinner and I put in my refrigerator, and now it's cold. In much the same way, with WIMPs we hypothesize that dark matter in the early universe was in thermal equilibrium with our matter. But after the Big Bang, the universe gradually cooled down and our matter fell out of equilibrium with the dark matter. Then the dark matter keeps finding itself and, through a process called annihilation, turning into our matter. But the reverse process can no longer go on because our matter doesn't have enough thermal energy. There are at least two other ways to detect the WIMP. One is at the Large Hadron Collider, as Enectalimentioned, and another is in these WIMP annihilations, where the WIMPs find each other and turn into our matter in certain places in the universe such as the center of stars or the center of our galaxy. If we get lucky, we could hit a trifecta; we could see the same particle with experiments like mine — LUX/LZ — or Enectali's SuperCDMS, we could see it in the Large Hadron Collider, and we could also see it astrophysically. That would be the trifecta. Of course there's a second reason why so many people are building these WIMP experiments, and that's that we've made a lot of progress in how to build them. There's been a lot of creativity using many techniques to look for these things. I will say that's partly true because they're a little easier to look for than the axion, for which you need really talented and expert people like Gray and Leslie Rosenberg. TKF: That's a nice segue into Gray's experiment. Gray, you don't look for the WIMP; instead, you look for something called the axion. It's a very lightweight particle, with no electric charge and no spin that interacts with our world very rarely. Can you tell us a little bit more about your experiment and why you look for the axion? G.R. : I look for the axion because if I looked for WIMPs then I would have to compete with very smart people like Harry and Enectali! But there are other really good reasons as well. The axion is a very good dark matter candidate. We think it may exist because of how physics works inside nuclei. It's different from the WIMP in that it's extremely light and you look for it by coupling to photons or, say a radio frequency kind of energy. I got involved in this because I was looking at dark matter and saw that there are a lot of people looking for WIMPs and not many people looking for axions. It's difficult to look for, but there have been some technical breakthroughs that help. For example, just about everyone has cell phones now and so a lot of work has been done at those frequencies — which just happen to be the right frequencies to use when looking for axions. Meanwhile, there's a lot of work on quantum computers, which means that there's also a lot of really nice low temperature radiofrequency amplification. That too helps with these experiments. So the time is right be looking for axions. TKF: Besides the WIMP and the axion, there are a lot of other theorized particles out there. One of our viewers wrote in and would like to know how likely is it that dark matter is in fact neither of the particles that your experiments look for but rather is composed of super heavy particles called WIMPzillas. H.N. : The WIMPzilla has WIMP in its name, so that means it's weakly interacting, and the zilla part is that it's just as massive as Godzilla. The way it works is that all of our astrophysical measurements tell us how much mass there is per unit volume – essentially, the cumulative total mass per unit volume of dark matter. But these measurements don't tell us how to apportion that mass. Are there a great many light particles or just a few really heavy particles? We can't tell from astrophysical data. So it could be that the dark matter consists of just a few super duper heavy things, like WIMPzillas. But because there wouldn't be many of them out there, to detect them you'd have to build it a gigantic detector. What we run into there is that nobody wants to give us billions of dollars to build that gigantic detector. It's just too much money. I think that's what keeps us from making progress on the idea of the WIMPzilla. The LUX detector before its large tank was filled with more than 70,000 gallons of ultra-pure water. The water shields the detector from background radiation. E.F.F. : There are many theoretical dark matter particles. We have to pick a combination of what we can look for with the experiments that we can build and what theory and our current understanding suggests are the best places to look. Now, not all of the theories have as good a foundation as others. Some would work but have different types of assumptions built into them and so we need to make a value judgment as experimentalists. We go to the "theory café" and choose which are the best courses on the menu, then we trim the list down to those that are the most feasible to detect, and then we look at which of those we can afford. That convolution of parameters is what prompts us to look for particular candidates. And if we don't find dark matter in those places, we will look for them elsewhere. And of course there's no reason why dark matter has to be one thing; it might be composed of several different particles. We might find WIMPs and axions and other things we don't know of yet. TKF: One of our viewers points us to a press release issued last week by Case Western University that describes a theory in which dark matter is made up of macroscopic objects. This viewer would like to know whether there's any reason why dark matter would be more likely to be made up of the individual exotic particles that you look for than it is to be made up of macroscopic particles. This concept that the dark matter might consist of particles that coalesce into solid or massive objects has been around for a long time. In fact, there was a search 20 or so years ago where they looked for large objects in our galaxy that were creating gravitational lensing. When you look at stars out in our galaxy, if they suddenly become brighter that's evidence of a massive object moving in front of them. You might wonder how an object moving in front of something would give it more light, but that's the beauty of gravitational lensing — the light focuses around the object. So this idea has been out there, and this paper looks to be a very careful reanalysis. Another example is an idea that's been around for a long time that maybe there is a different kind of nuclear matter out there. Our nuclear matter is made of up and down quarks and maybe there's another type of nuclear matter that involves the strange quark. People have been searching for that for 30 or 40 years, but we've never been able to find it. Maybe it exists and maybe it's the dark matter we're searching for. I would say that in some estimate of probabilities it's less likely, but we could be wrong. What's great is to have the scientific discussion always going because the probabilities get reassessed all the time. G.R. : These massive objects have a very amusing acronym. They're massive compact halo objects, MACHOs. So for a while it was MACHOs versus WIMPs. E.F.F. : One thing that I would add is that this paper and this whole idea of the variety of models really highlights how diverse the possibilities for looking for dark matter are. In that paper, they looked into mica samples that had been buried for many, many years, looking for tracks. When you have a candidate, the theoretical community starts scanning every possibility of a signal that might have been left — not just in our detectors, but also in the atmosphere, in meteorites, in stars and in the structure that we see in the universe. There are other detectors out there that are more indirect than the ones we've specifically designed for dark matter. That's one of the things that makes it exciting: maybe we find dark matter in our detectors and we might also find traces of it in other things that we haven't even thought about yet. University of Washington physicists Gray Rybka (right) and Leslie Rosenberg examine the primary components of the ADMX detector. TKF: In the history of particle physics, there have been a number of particles that we knew existed long before we were able to detect them — and in a lot of cases, we knew a lot about these particles' characteristics before we found them. This seems very different from where we are now with dark matter. Why is that? What is fundamentally different here? G.R. : We know about dark matter from gravitational interactions, and we have a hard time fitting gravity in with the fundamental particles to begin with. I think that's a big part of it. Would you all agree? H.N. : There are some analogues, but you have to go back in time quite a bit. One of the famous analogues is the discovery of the neutron. The proton was discovered in a fantastic series of experiments during World War I by Rutherford, but he had good intuition and thought there should be another particle that's like the proton that is neutral, which they called the neutron. Even though they had a pretty good idea what it should be like, it took 12 or 15 years for them to detect one because it was just difficult. Then there was an experiment done by Frederic and Irene Joliot-Curie and their group in France and they interpreted the results in a very strange way. But a guy named James Chadwick looked at their data and said, "My God that's it!" He repeated the experiment and proved the existence of the neutron. That story is so important because the neutron is the key to most uses of nuclear energy. I suspect with dark matter we'll have some sort of rerun of that. We're all looking and somewhere, maybe even now, there's a little bit of data that will cause someone to have an "Ah ha!" moment. E.F.F. : We also have this nice framework of the Standard Model, but right now we don't really have one single theory of what should come after it. The most popular possibility is supersymmetry, which is one of the things that a large number of physicists at the Large Hadron Collider are trying to find. But it's not at all clear that this is the solution of what lies beyond the Standard Model. That ambiguity leads to a plethora of dark matter models because dark matter lies outside of the framework of the Standard Model and we don't know in which direction this model will grow or how it will change. Physicists are looking at all the possibilities, many of which have good dark matter candidates. There's this chasm between where we are now and where the light of understanding is, and we don't yet know which direction to go to find it. So people are looking in all possible directions generating a lot of great ideas. TKF: It seems that the results of your experiments will direct the search in one way or another. One of our viewers would like to know a little bit more about how you go about detecting dark matter in your experiments. Since dark matter really doesn't interact with us very much, how do you go about seeing it? G.R. : Our experiments use very different techniques. My experiment looks for axions that every once in a while couple to photons. They do so in a way that the photons produced are of microwave frequencies. This is quite literally the frequency used by your cell phone or in your microwave oven. So we look for a very occasional transmutation of an axion from the dark matter around us into a microwave photon. We also help this process along using a strong magnetic field. Because the frequency of the photon coming from the axion is very specific, this ends up being a scanning experiment. It's almost like tuning an AM radio; you know there's a signal out there at a certain frequency, but you don't know what the frequency is so you tune around, listening to hear a station. Only we're looking for a signal that's coming from dark matter turning into photons. E.F.F. : Both Harry and I look for similar particles, these WIMPs. My experiment is particularly good at looking for WIMPs that are about the mass of a proton or a couple times heavier than that, while Harry's experiment is better at looking for particles that are maybe a hundred to several hundred times heavier than the proton. But the idea is the same. As Harry mentioned before, we know the density of dark matter particles in our region of space in the galaxy, so we can calculate how many of these dark matter particles should be going through me, through you, through your room right now. If you stick out your hand and you assume that WIMPs are maybe sixty times the mass of the proton — I'm just picking a number here — you calculate that there should be about 20 million WIMPs going through your hand every second. Now these dark matter particles go straight through your hand and straight through the Earth, but perhaps very occasionally they interact with one of the atoms in the matter that the Earth is made of. So we build detectors that hope to catch some of those very, very rare interactions. My experiment uses a crystal made out of germanium or silicon that we cool down to milli-kelvin temperatures: almost at absolute zero. If you remember your high school physics, atoms stop vibrating when they get very, very cold. So the atoms in this crystal are not vibrating much at all. If a dark matter particle interacts with one of the atoms in the crystal, the whole crystal starts vibrating and those vibrations are sensed by little microphones that we call phonon sensors. They also release charge and we measure that charge as well. Both of those help us to determine not only the energy that was imparted to the target but what type of interaction it was: Was it an interaction like the one you would expect from a photon or an electron, or was it an interaction you would expect from a WIMP or perhaps a neutron? That helps us to distinguish a dark matter signal from backgrounds coming from radioactivity in our environment. That's very important when you're looking for a very elusive signal. TKF: In fact you even go to the extent of working far underground to reduce this background noise, is that right? E.F.F. : That's right. And I'll actually let Harry take it from here. H.N. : Our experiments are going to be in two different mines. Ours is about a mile underground in western South Dakota in the Black Hills — the same black hills mentioned in the Beatles song Rocky Raccoon. Meanwhile, Enectali is up in Sudbury, Ontario, where there's a heavy metal mine. One analogy I wanted to bring up is that what Enectali and I do is a microscopic version of billiards. The targets — in my case are xenon and in his case germanium and silicon — are like the colored balls on a pool table, and what we're trying to detect is the cue ball — the dark matter particle we can't see. But if the cue ball collides with the colored balls, they suddenly move. That's what we detect. As Enectali said, the reason we go deep in a mine and the reason we build elaborate shields around these things is so that we aren't fooled by radioactivity or neutrons or neutrinos moving the billiard balls. And there are a lot fewer of these fakes when we go deep. Plus, it's an awful lot of fun to go in these mines. I've been working in them for ten or fifteen years now and it's great to go a mile underground. TKF: If one of your experiments is successful in seeing dark matter, Enectali you said in a previous conversation that the next steps would be to study the dark matter particle's characteristics and use that knowledge to better understand the particle's role in the universe. I'm hoping you can explain that last bit a little bit further. Just how far-reaching would such a discovery be? E.F.F. : We're very lucky in that we get to ask these really big questions about what the universe is made of. We know that dark matter makes up about 25 or 26 percent of the universe, and through direct detection we're trying to figure out what that is exactly. But even once we know the mass of the dark matter particle, we still need to understand a lot of other things: whether it has spin, whether it is its own anti-particle, all kinds of properties of the particle itself. But that's not all that there is to it. This particle was produced some time ago. We want to know how it was produced, when it was produced, what did that do to the universe and to the formation of the universe. There's a very complicated history of what happened in the universe between the Big Bang and today, and dark matter has a big role to play. Dark matter is the glue that holds all the galaxies, all the clusters of galaxies and all the super clusters together. So without dark matter, the universe would not look like it does today. The type of dark matter could change the way that structure formed. So that's one very important thing that we would like to understand. Another thing is that we don't really know how dark matter behaves here in our galaxy today. We know its density, but we don't really know how it's moving. We have some assumptions, but it will be very interesting to really understand the motion of dark matter – whether it's clumpy, whether it has structures or streams, whether some of it is in a flat disk. The answers to these questions will have implications for the stars in our galaxy and beyond. All those things will be the next step in what we would love to be doing, which is dark matter astronomy. TKF: We have one last question from a viewer who identifies herself as "an interested artist." Her question is: If you find dark matter, what are you going to call it? It won't be dark anymore. G.R. : I can start with a bad idea. It was called dark matter originally because when you look up at the sky, there are things that produce light — like stars — and there are things that we know are out there because they interact gravitationally but they're not producing light. They're dark. But that name kind of implies that they absorb or block light, when in fact dark matter doesn't. Light goes right through it. So you can call it clear matter, but dark matter at least sounds mysterious. Clear matter sounds rather boring. H.N. : I hope you get people better at language than physicists to answer this! If it's physicists who name it, we'll end up with a name like gluon. I'd prefer to have a better name than that. Since this viewer is an artist, I'll point out a sculpture at the Tate in London by Cornelia Parker called Cold Dark Matter: An Exploded View. This idea that there's something out there that we can't sense yet is one of those things that sends chills down my spine. I think that scientists share that feeling of wonderment with artists. E.F.F. : I'd love to have a naming contest for this 20-some-odd percent of the universe. I think it would produce much better names than we would come up with on our own.